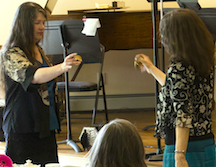 I recently played zills in an informal but poignant flute recital with a former student. She lives in the mountains, and she and her family were evacuated during the flood that hit the Front Range in Colorado in 2013. In the chaos and confusion, her treasured silver flute disappeared.